The DynaPro Narrow Lug Mount (DPN) forged billet caliper represents the newest version of calipers available with narrower outboard clearance. DPN calipers combine pure race technology with several new exclusive Wilwood performance enhancements. A sleek profile with superior strength and a fully detail machined finish provide the performance. 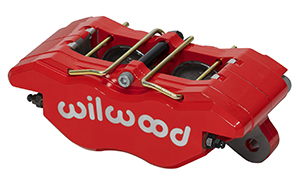 Available in Wilwood’s Type III anodize or enhanced with black or red powder coat finish.